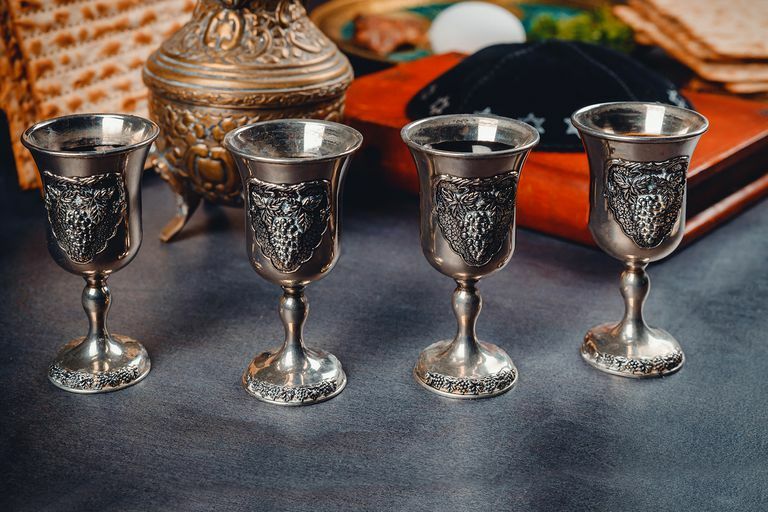 At the Passover seder, Jews usually drink four cups of wine while leaning to the left, according to the Haggadah service, but the reason why is elusive to many. Considered a royal drink, wine symbolizes freedom, which is what the Passover seder and Haggadah celebrate. In Genesis 40:11-13, when Joseph interprets the dream of the butler, the butler mentions the word "cup" four times. The Midrash suggests that these cups alluded to the liberation of the Israelites from Pharaoh's rule. There's a reason provided, also, that in the Haggadah Jews read about the forefathers Abraham, Isaac, Jacob, and Esau, and Jacob's son Yosef, but the matriarchs do not appear in the narrative. This view suggests that because of this, each cup of wine represents one of the matriarchs: Sarah, Rebekah, Rachel, and Leah. The Cup of Elijah is the fifth cup that appears at the seder.